See following URL for older records before 2005. 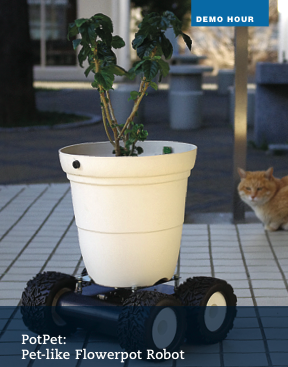 Pot Pet demonstrated at TEI 2011 by Ayumi, is shown on an ACM publication. Finnish magazine reports Centria's activity. 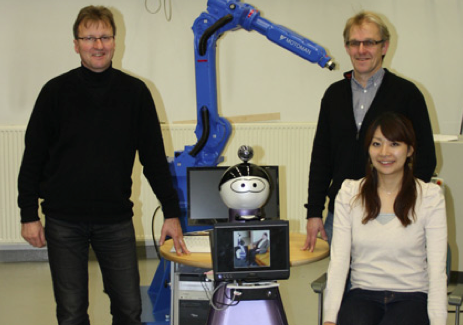 "Japanese exchange researcher Mizuho Komatsuzaki together with CENTRIA’s Kompai service robot and Senior Research Scientist Sakari Pieskä and Laboratory Engineer Jari Mäkelä." Web magazine reports the IVRC 2010. TV show: BS Japan "Yononaka Shinpodo"
#ref(): File not found: "bsj20100712.jpg" at page "SiioLaboratory"
#ref(): File not found: "foxnews.jpg" at page "SiioLaboratory"
TV show: Fuji Television "Kinmirai Yoho Tsugikuru"
ICCでの展示に関連してがポッドキャスト配信されています. The interview to students has been Pod-casting by ICC. 年末総集編スペシャルで一部が再放映されました．A part of the program has also been on air again. Web magazine: "Warera crazy engineer shugi"
PukiWiki 1.5.1 © 2001-2016 PukiWiki Development Team. Powered by PHP 7.1.23. HTML convert time: 0.022 sec.